American history according to Abraham Lincoln: Vampire Hunter: The Civil War was fought over slavery because the vampires, living in the South, wanted to keep the slaves as their primary food source. (Too difficult to feed on free blacks?) Jefferson Davis himself was in cahoots with the vampires (Jefferson Davis: Vampire Conspirator) and asked their king, Rufus Sewell, to have the vampires fight the Battle of Gettysburg for the Confederate Army. The Civil War was not just fought by brother against brother, but by human against vampire, the vampires secretly fighting to overthrow the Union and create their own vampire nation. Your history books are wrong. Also, better, much better than this fake vampire history. Sewell does monologue that as a vampire living for five thousand years, he's seen Jews, Christians, and Negros enslaved, so really, everyone's a slave to someone. The vampires in this movie are slaves to fashionable sunglasses. Portraying Abraham Lincoln as a vampire hunting young man and then, in old man makeup, as the 50 year old vampire hunting 16th President, Benjamin Walker is the spitting image of a babyfaced Liam Neeson. Lincoln's life is devoted to avenging the death of his mother by a vampire (Martin Csokas) and his vampire hunting skills are honed by his vampire mentor Dominic Cooper. Cooper personally tells Lincoln which vampires to kill and when. Later, after Lincoln has killed a significant number of his brethren, Sewell asks Lincoln to work for him to kill Cooper instead. Either way, Abraham Lincoln: Vampire Hunter is really Abraham Lincoln: Vampire Employee. Lincoln's vampire hunting exploits are later joined by his black childhood friend Anthonie Mackie and his first (human) boss when he was a shopkeeper, Jimmi Simpson, all of whom, including Cooper, follow him to the White House and become his Cabinet. Lincoln also romances Mary Todd (Mary Elizabeth Winstead), the Michelle Obama of her day. Though possessing no actual superpowers, Lincoln nevertheless possesses superpowers, exhibiting the ability to slow-motion chop vampires to pieces with his trusty axe, its blade lined with silver, the vampires' only weakness. Lincoln never asks a vampire if he can axe him a question and then axes him, though. Lincoln can also perform other utterly ridiculous feats like survive a horse tossed at him by a vampire and then mount said horse in one motion, run across the backs of stampeding horses, and leap across trains over a flaming bridge. The vampires look tough with their enormous, saliva-spitting mouths full of dagger-like fangs, but they sure are easy to kill when they charge in black-ninja style. Even Sewell went out without much fuss, which was a huge letdown. By the time Lincoln has equipped the Union army with silver weapons in the Battle of Gettysburg, the whole Union Army becomes Abraham Lincoln's Vampire Hunters. Sadly, Lincoln still goes down to a bullet to the noggin from John Wilkes Booth. The movie never says if Booth is working for vampires or not. 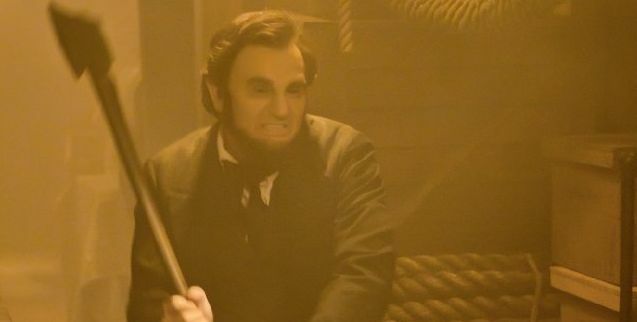 One thing Abraham Lincoln: Vampire Hunter brings to mind: Buffy the Vampire Slayer sure did luck out that when she kills vampires, they just turn to dust. No bodies to bury. Lincoln, to his chagrin, spends just as much if not more time burying vampire corpses than he does killing vampires. Abraham Lincoln: Vampire Burier.